The P. A. Bowen farm is located on a tract known as “Purchase,” first patented by Thomas Truman in 1665. Truman built the original house, which now serves as the kitchen. The next owner was Philander A. Bowen, who built the present house, in front of the original house, moving his family in shortly after 1870. During the Bowens’ residence, the farm was a self-sufficient community that included a brick stable, ice house, meat house, tobacco barns and corn crib, as well as tenant dwellings and other functional buildings. Of these farm buildings, only one tobacco barn remains today. Members of the Bowen family remained on the farm until 1927. 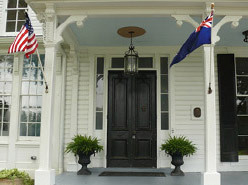 The two-and-one-half storied house is considered a fine example of Italianate colonial architecture. It has been lovingly restored by the present owners, Geoffrey and Sally Morell. The village of Aquasco, formerly called Woodville, is named for a nearby tract first surveyed and patented in 1650. The name is derived from the Native American name “Aquascake,” which was included on a map made by John Smith of Jamestown fame, when he explored the Patuxent River. Located between Swanson’s Creek and the Patuxent River, the community developed as an agricultural center for the production of tobacco. Sparsely settled, the widely scattered tobacco plantations were connected by a road established in the 18th century and, in the early 19th century, the village of Woodville began to form. The village was named after the Wood family, early settlers of Aquasco. By mid-century, the village had a grist mill, several small stores, a tavern, blacksmith, school, post office, and Methodist and Episcopal churches. Later the village served as the site of the Aquasco Speedway, for automobile racing, which is no longer in operation. The P A Bowen Farmstead is a mixed-species pasture-based farm incorporating, organic and bio-dynamic methods. Owners Geoffrey Morell and Sally Fallon Morell hope that the P. A. Bowen Farmstead will serve as a model for other farms, inspiring farmers—both established and new– to produce an abundance of naturally raised foods and bring prosperity to Southern Maryland and to farming communities throughout the U.S.
We are happy to share our vision and production methods with farmers, regulators and educators. We also offer farm tours so visitors can learn about our integrated farming techniques. The centerpiece of our farm is artisan cheese, produced from our small herd of grass-fed Jersey cows. 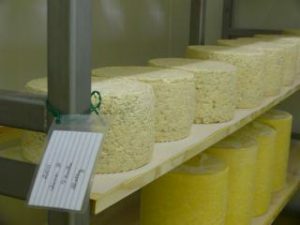 The cheese is produced on the farm by cheesemaker Sally Fallon Morell and her assistants. Our signature cheeses are Prince George’s Blue and Chesapeake Cheddar. When cheese is produced, the farmer has whey as a by-product. In industrial cheese production, whey is a problem, as it cannot be disposed into the sewage system, but must be foisted on the public as a dehydrated product—whey powders marketed to athletes and in “health food” products. 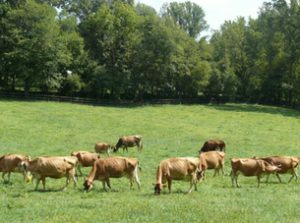 On a pasture-based mixed farm, however, the whey is a solution, as it is a great source of protein for pigs and poultry. The grain that we give our chickens is a mixture of non-GMO sorghum, barley and field peas. With whey as a protein source, along with insects and larvae that the chickens consume in the pasture, we can produce a superior soy-free product. 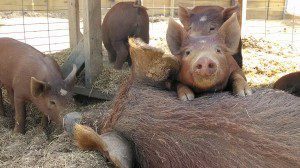 Our pigs get the same grain mix, plus whey, and roots and nuts that they find in the woods. Likewise, in the industrial system, manure is a problem; but on a pasture-based farm, manure is the solution to soil fertility. On large-scale industrial farms where cows are kept in confinement, the manure must be collected in lagoons where it becomes an environmental hazard. If spread raw on the fields, it often simply washes off during heavy rains into the aqua-shed. On a pasture-based farm, the manure is deposited daily in amounts the ground can handle, by four-legged manure-spreaders—our cows! Chickens moved into the pasture a few days after the cows have been there scratch through the cow paddies and spread the manure. This also helps with fly control as the chickens eat the fly larvae. 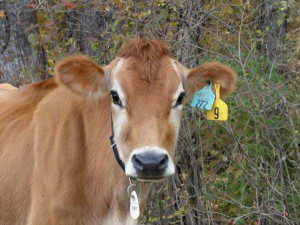 The soul of the P A Bowen Farmstead is our herd of Jersey cows. The cows are named after famous opera singers and characters in well-known operas, and are presided over by our Jersey bull Caruso. All of our animals live outdoors (except during periods of very cold weather with rain or snow). Our dairy cows are moved to a new section of pasture daily, kept in by electric fencing. This system is called Managed Intensive Grazing. It is a method that increases soil fertility and the amount of cows that the land can support. The cows graze on pasture and hay and receive a small supplement of soy- and corn-free grain during milking. They are milked only once daily, in the morning, thus sparing them from overproduction of milk and sparing the farm staff from the duties of afternoon milking. We raise both laying hens and meat birds at P. A. Bowen Farmstead. Several days following the cows grazing an area come the laying hens, which obtain a large portion of their protein by eating fly larvae in the cow paddies during the growing season. 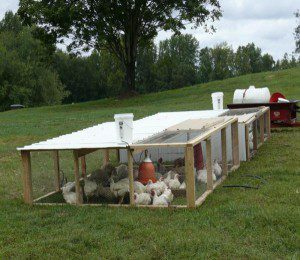 The laying hens inhabit our mobile “Eggmobile,” which is surrounded by electrified netting, giving them a new pasture every day and shelter at nighttime. 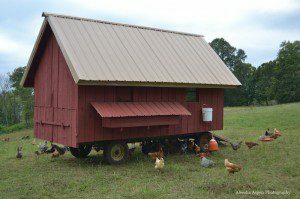 The meat birds reside in movable “Chicken Tractors” and are also moved to a new patch of pasture daily. This technique gives the birds a wholesome diet of greens and bugs, while simultaneously feeding our pastures with rich manure. 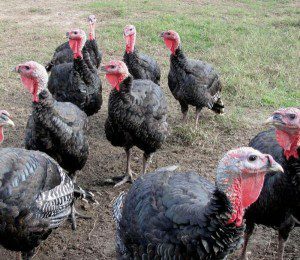 The goofy guys on the farm are our turkeys, which keep together as a noisy flock as they explore the farm. Unlike our laying hens, the turkeys are not kept in with electric fencing. If you visit our store in the late summer and fall, they may be there to greet you. 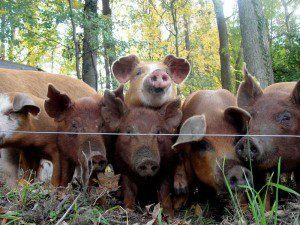 Our Berkshire, Tamworth and spotted heritage pigs enjoy nuts and roots (in addition to whey and grain) in our wooded areas. They are constrained within a safe area by an electrified wire, placed just at nose level. Thus the various species are integrated in a system that maximizes fertility and production. For example, the pigs root the soil and rough up the ground in each section of woods in which they are confined. When they are moved to a new section of woods, grass then comes up in the section where they were previously. What was once dense, unusable thickets becomes beautiful savannahs, where the cows can enjoy cool summer grazing. For information on farm tours, click here. If you are interested in taking a Farm Tour Call (301) 579-2727 for availability.